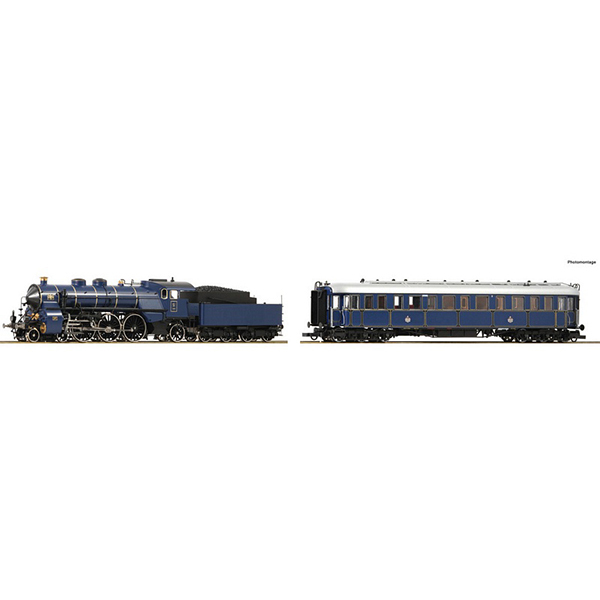 Roco 61473 2 piece set Steam locomotive S 3-6 and Prinzregenten coach K Bay Sts B2 piece set with steam locomotive class S 3/6 and “Prinzregenten” coach of the Royal Bavarian State Railways. With the steam locomotive of the S 3/6 series, an extremely powerful and state-of-the-art designed locomotive rolled on the tracks until 1931. The locomotives reached, even when they needed to handle a towable mass of more than 400 tonnes, which at that time meant to haul about 10 express train passenger coaches, a top speed of about 135 km / h. The "high-axled" locomotives with their superheated steam four cylinder compound running gears had a very smooth running. The fuel consumption was also kept low, so after only a few years of operation it was still possible to manage even longer distances of more than 800 kilometers. The 3618 was considered a parade locomotive at that time and so it is quite likely, that the "Blue Beauty" even had a saloon wagon for the royal family.